Be the first of many to find out when it will be released and how you can be the first to get it. Because I know this workout will sale out fast! With INSANITY, Shaun T gave you a year’s worth of results in only 60 days. And now, 5 years later, it’s time for INSANITY MAX:30— the hardest 30 minutes of your life. There’s no equipment needed; just push to your MAX and get insane results in 30 minutes a day. In INSANITY MAX:30, the only thing standing between you and the body you want . . . is YOU. Every day you’ll push a little harder, go a little longer, and dig a little deeper. It’s not about finishing the workout—it’s about seeing how far you’ll go before you MAX OUT. One more minute. One more rep. One step closer to the body you want. INSANITY MAX:30. Ok have you ever wondered why Inanity workouts are so long? I mean they’re not really long, but after the warm-up you already feel like your ran a 10k race right? Ok so Insanity Max30 is all about getting insane results in 30 minutes, but delivering a high intensity workout. I’ll be honest with you. I don’t know a whole lot about this workout yet. But I do know that if you’ve done insanity and you quite the first time, then this is something you may want to consider. Modify as you need to, take breaks when you need to. Just jump in and push yourself to get the results you want. I want to hear from you. What do you think about this workout? Are you going to give it a try? Here lately the the two HOTTEST workouts on the Beachbody market are Shaun T’s Insanity and Sagi Kalev’s Body Beast. To go along with that are popular questions comparing the two. 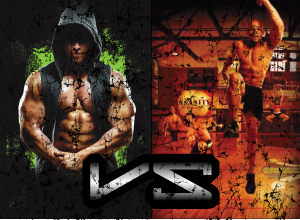 So Im going to do a Body Beast vs Insanity break down. — I going to stick this in at the top also, (I usually put this at the bottom). If you have any comments please feel free to leave them! I love hearing your feedback and if I’ve helped you in your decision towards a workout, or you’ve gotten one from my site please share this with your social networks and/or leave a comment! — I’ve done both workouts. In fact right now Im trying to create a hybrid schedule to do both Body Beast and Insanity for a 90 day cycle. Comparing these two workouts is like comparing golf balls to base balls. Both are round, both are hit with an object, and both can travel a long distance. They sound very similar. Two completely different games though. Both workouts will leave you exhausted, sweaty, and will get you in great shape. The road to travel though is very, very different. It’s high impact interval training. Right out of the gate it seems like your going 110 mph. I remember when I first did Insanity the warmup kicked my but. You go straight into jogging in place to jumping jacks, to mountain climbers and jumping rope (a pretend jump rope) and then you do it again a little faster, then one more time as fast as you can. Then you stretch. Then you start your workout. Don’t let that scare you though! Insanity for me improved my endurance 100%. It’s always my favorite summertime workout because in the summer most people love being outside whether its working in the yard, playing sports or just messing around with friends or the kids out in the yard. After the first time I did Insanity I remember running in my first race, ever! It was a 10K race. I didn’t even know how long a 10K was. The friend that I was running with was making fun of me, telling me they were going to beat me. Well to make a long story short I ended up beating them by almost 3 minutes. I had never felt better. My heart rate was under control, I wasn’t even out of breath. Thanks to Insanity! Theres virtually no equipment needed for this workout. All you really need is 1. water and 2. a soft surface to jump around on. You will sit on the ground also to do some of the moves, so a concrete floor isn’t the best idea for that, so a least have some sort of mat that you can sit on. Oh and have a good pare of shoes! Most all the moves you can do with in a 6′ x 6′ area and thats plenty. All the moves are pretty simple to do. But Shaun T doesn’t play around. His combination of moves keeps your heart rate up and the sweat flowing. 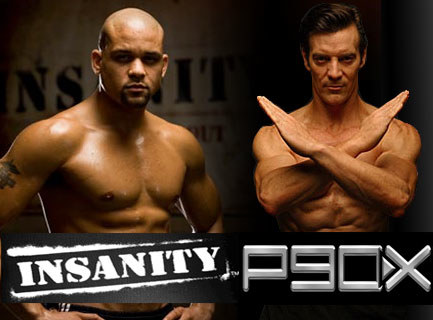 You can check out this short video to see what you can expect from Shaun T’s Insanity. With Insanity you will get in amazing shape. You can get 6 pack abs, toned muscles and you will eventually be able to perform your favorite activities at an athletes pace. Well at least close to that. Your body will be conditioned to handle just about any activity you throw at it. I like extreme sports, activities and mud runs. This is the perfect workout to get ready for something like that. Of course you don’t have to like any of that stuff to like Insanity. Bottom line if you just want a great workout that doesn’t involve equipment then this is your workout. This is a little slower paced workout. Don’t be fooled though! This workout is jam packed with old school weight lifting techniques with some new school moves to. Sagi has been a body builder for a long time. He really knows how to help you get bigger and stronger muscles in just 90 days! The best part is he’s done it all naturally. By that I mean that Sagi hasn’t used steroids to get where he’s at. I liked doing this workout because it was completely different from any other workout that I’d done in the past few years. Its basically all weight lifting. I increased my muscle mass much more than I thought I would. There is some cardio with the Beast program. Again don’t be fooled. With all the weight that your throwing up, you’ll burn some massive calories with it. You can achieve 6 pack abs, bigger arms, lats, shoulders, chest and legs. Any muscle you can name, you’ll see some improvement in. This is strength training. Thats really it in a nut shell. The reason I want to create a hybrid between the Body Beast and Insanity is because Im looking to achieve the muscles and have the performance of an athlete. I’m not sure that I’ll obtain the same amount of mass, but thats what Im going to do this time. With Body Beast there is equipment that you’ll need. And to go along with it, I would highly recommend the supplements to go with it. My personal opinion is, if you do Body Beast without the supplements, Its like buying a car and never putting gas in it. And using something besides twhat’s been formulated for the Beast workout is like buying a car that that requires 93 gas and you put in 87, it just doesn’t make sense. I have another post on the Equipement and Supplements if you want to read up more on it or you can check out resources from MyBodyLife if you are an intense powerlifter and are planning to upgrade your supplement intake. Check out this short video on what the Beast is like. Really its not just with Body Beast and Insanity, it’s with all the Beachbody workouts. Its the Nutrition. Both the Beast and Insanity come with a well planned nutrition guide. Again they are both very different. Insanity is going to help you in eating things that will help you lose weight and get those toned muscles. Body Beast also has a healthy guide, but its food is more focused on helping you get the required calories to get the muscle mass. Something to consider with both workouts, is Shakeology. Its just smart nutrition. So which workout is it going to be for you? The easiest and most economical way to get these workouts is with a Challenge Pack. The Challenge pack has all you need in it. With the Beast you get the workouts, the nutrition plan and all the supplements. See Eiyo if you haven’t chosen the natural supplements that suit you best. With Insanity, you get the workout, the nutrition guide and Shakeology. Of course if you just want the workouts you can get that too. Get the Body Beast Challenge Pack. Get the Insanity Challenge Pack. (The Challenge Pack is the best bang for the buck). Get Body Beast, get Insanity (workouts only). You can alway get free account with me. I hope this has been useful information for you. If this has helped you in any way, please click the Facebook “Like” button below this post, and share my site with your friends! Also become a fan of my Facebook Page. What’s The Easiest Way to Lose Weight? It’s almost Christmas and Thanksgiving is once again in the past. Are you one of the people who had to visit with lots over the Thanksgiving holiday? If so you may be wanting to know what’s the easiest way to lose weight? Well believe it or not I do have the answer for you. There are actually a number of suggestions that Im going to share with you that will work well for you and even be a great Christmas gift for your family or close friend! Lets dig into the facts for just a minute. Most average people will gain between 8-12 lbs from Thanksgiving to New Years. Most of it comes from the home parties and office parties due to the holiday cheer. Im going to share with you some of the easiest ways to lose weight FAST and actually save some money over this holiday season! Saving money this holiday season is actually easier than you might think. This is my suggestion. STOP feeling like you have to give to everyone. Now don’t get me wrong…I’m not being a scrooge. But there is no reason to buy for people who a. don’t need anything, and b. just because they’ve bought for you. I would encourage you to actually reach out to the people on your normal Christmas list and and simply suggest that you not exchange gifts this year mainly because there is nothing that you really need. Take the money that you both would spend on something that you think the other would like and pay down some debt with it…WOW yes I just said that. Pay off some debt. Now that’s a real gift for the holiday season, that any and everyone will appreciate. I know that I can personally do without another pair of socks that I wouldn’t even buy myself this year or some useless device that I really don’t have room for now. I love Christmas, because its about Christ. Our government, has allowed it to become such a big deal and we’ve been lead to believe that if we don’t share, then we don’t care. And that just isn’t the case. So my suggestion would be to buy a pack of cards, and write something nice about the person or family your giving it to. That will last forever. Also, stop all the unhealthy baking, of cookies and pies. It is a good idea to introduce healthy eating habits. If it is difficult for you to prepare substantial and healthy food every day, you can try a meal delivery diet. With every get-to-gether we always feel like we should take some food, and the easy thing to take are…you guessed it, cookies and pies. While not hard to make and not that expensive, but if you do it several times during the holiday season, it can add up. There just isn’t a need to do it, and people don’t need the unhealthy foods! So if your like me, then I probably just saved you at least $500 to $1000 on unnecessary giving. Now the best news is you can get a great, easy plan to lose weight and start losing it fast for less than the $500 I just showed you how to save! Check out CoolSculpting EDU for more! Looking for What’s The Easiest Way to Lose Weight? This is the Beachbody Ultimate Reset. What is it? Well this is the best and healthiest way to reset your body. Its a 21 day challenge. This comes with a meal plan that is strict and very precise. For 21 days you’ll learn how to eat healthier, what super foods are and how to use them. You’ll break free from you caffeine addictions and junk food addictions, without ever having to lift a weight or go to the gym! We’ve done our research with this one folks! Check out Megan’s results. Regardless of your size you can do this, and get great results! Now I want you to keep in mind, that after you finish the 21 Day Ultimate Reset, you will never have been more ready to start a workout program. In fact studies show that most people have more energy and actually those who worked out before doing the Ultimate Reset performed better and lifted heavier once going back to their workout routine. Yes, the Ultimate Reset is an the easiest way to lose weight, because you don’t workout at all when doing it. But the fact is, once the 21 days are over, you will need a plan in place to continue this new healthy lifestyle and you’ll WILL BE READY for it. Ready’er than you’ve ever been! 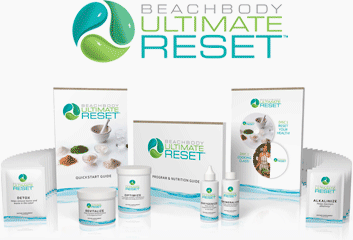 There are several ways to get the Beachbody 21 Day Ultimate Reset. All you need to do is pick the package that suits you the best. You actually have so many options, and if you have money you can even get done surgical procedures with roxanne grawe, who is one of the best ones in cosmetic surgery. And again, with the money that I’ve already told you how to save you can get a great workout, plus the nutrition from Shakeology, all for yourself, and still have enough to get one for a close friend, relative or your spouse. I’ve written several articles on most of these workouts, so it won’t be hard for you to do your research on them. How ever, Im going to list them out from Basic/Beginner to Advanced. With all these programs, you get free support, you’ll get me as your coach, and an online community to further help you in achieving your goals. We have a proven system that works. Are you ready for your new life or are you going to hide in fear? We’re here to help you, but you have to be willing to help yourself…what are you going to do? If this post helped you in any way, or inspired you, or you just simply enjoyed the content, would you please share my site with your friends and on your social networks? Thank you and God bless! Yep, that’s me and my teammate. Tired wasn’t the word for it. But it was an absolute blast to do this challenge. 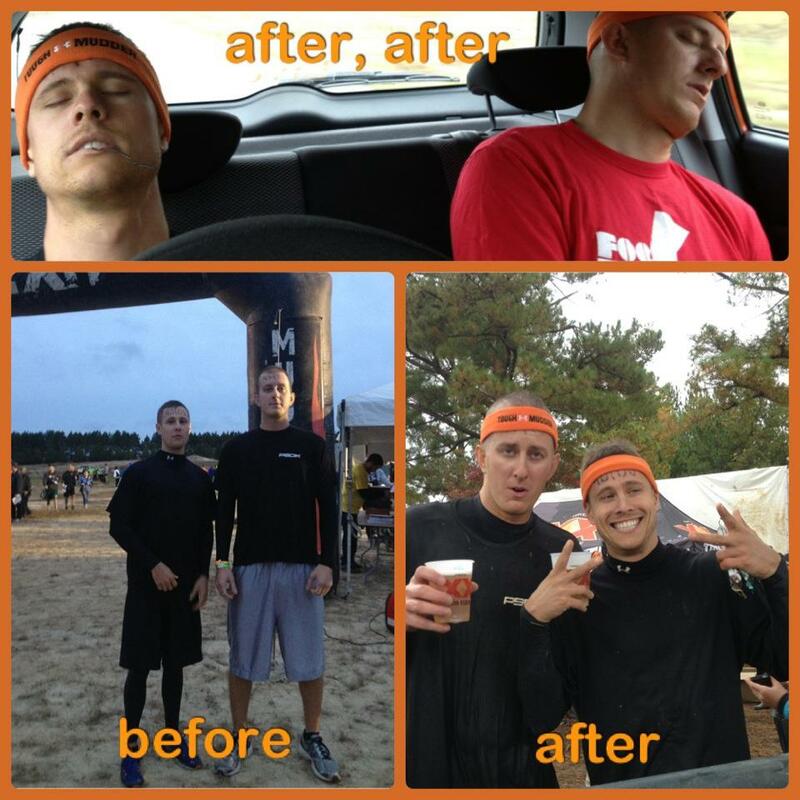 We ran in the Tough Mudder Carolina’s 2012 on Saturday, October 27th. We live in NC so we had to drive down to SC and stay the night that Friday. It wasn’t really that far away, just a little over 2.5 hours. Neither of us had ever done TM before so we were just like you are now…NERVOUS! I don’t think either of us or even the girls slept that Friday night. We had an 8am start time, so the only thing that we were really, Im going to use the word anxious about was the obstacle called Arctic Enema. Jumping in a big dumpster full of 32˚F ice water at 8am was a bit intimidating to say the least. I think we all ended up getting out of the bed about 5am that Saturday morning getting ready and heading out to the course which was only about 10 minutes from our hotel…thank you Tough Mudder! The first bit of advice I would give you is, get there about an hour to hour and a half early. Theres plenty to keep you entertained while your waiting. It probably going to take you about 10 minutes to get from the car to the entrance, then you’ll check in, then have someone right your number on your forehead and leg/arm. My teammate wanted to get a mohawk, so we had to wait on that also. They were actually calling our time as he was in the chair getting shaved so, you want to be sure to allow time for stuff like that. That one is really going to be a hard question to answer. It’s really going to depend on what the weather is supposed to be like. If it going to be hot, probably just a pair of runners shorts or some ball shorts, assuming your not going to dress up for it, then your on your own. We actually got lucky and it was about 60˚F all day so I chose to wear UA (Under Armour) Cold Gear Compression shirt and leggings, with a pair of BBall shorts over (for courtesy) and just a light T-Shirt over top. From being wet most of the day, the UA actually kept me warm the entire time, and dried relatively fast! I would definitely recommend it if your not running in warm weather! As far as shoes, I wore the MEN’S UA CHARGE RC RUNNING SHOES. The shoe itself performed well. It was light on my feet and it cleaned up VERY EASY. The only problem the I had was I got a lot of sand in my shoes, of course that is to be expected when your running 12 miles in mud that sometimes came up to my chest (im 5’7″). Im going to continue to research before our 2013 run. I did find that once I got home and washed out my socks that most of the sand was actually inside my sock, so that leads me to believe that the shoe did its job. So if you ran in that shoe, I would suggest getting some long knee socks, and not ankle (footy) socks. Either way, remember that unless your Superman your going to get dirty, sore and maybe if your lucky some cuts and bruises. Now I have done just about ever kind of workout that Beachbody offers plus just done normal workout that you would do in the Gym/treadmill etc. I actually have 4 suggested workouts. I would use 2 of them together in combination to get ready for Tough Mudder, because it is probably the toughest event on the planet. I would highly recommend these 4 workouts to train at least for 6 months before your TM. Now me personally I’m on my last week of Body Beast and I incorporated Insanity the Asylum in about 45 days leading up, but mind you Im in pretty good shape. I would do P90X or Body Beast with either of the Insanity works. I have tones of Hybrid workouts so just let me know your training for TM and I’ll send you the schedules. Now I would recommend getting either the P90X or Body Beast Challenge Pack. You need to feed your body the right things so don’t waste your time on the cheep stuff from Walmart. You put good in your get good out, you put bad in your get bad out! Im not going to go into lots of detail here, Your just going to have to trust me. In fact let me just say if you get either of the challenge packs, just get Insanity the Asylum. The moves in this workouts really help in the most all the obstacles your going to go through and it helps build stamina for running/jogging the 10-12 miles! If this helped you at all, please share this page and click the ‘Like Button’ below. 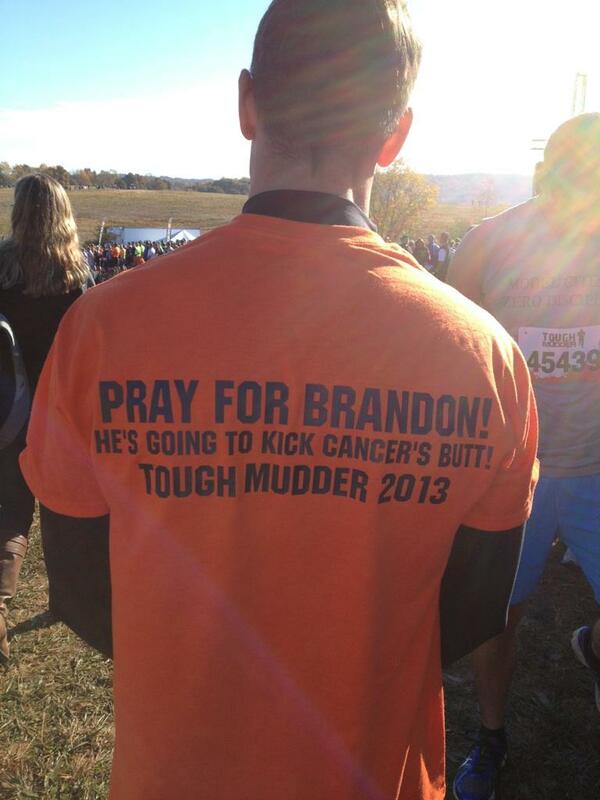 Good luck fellow soon to be Mudders. 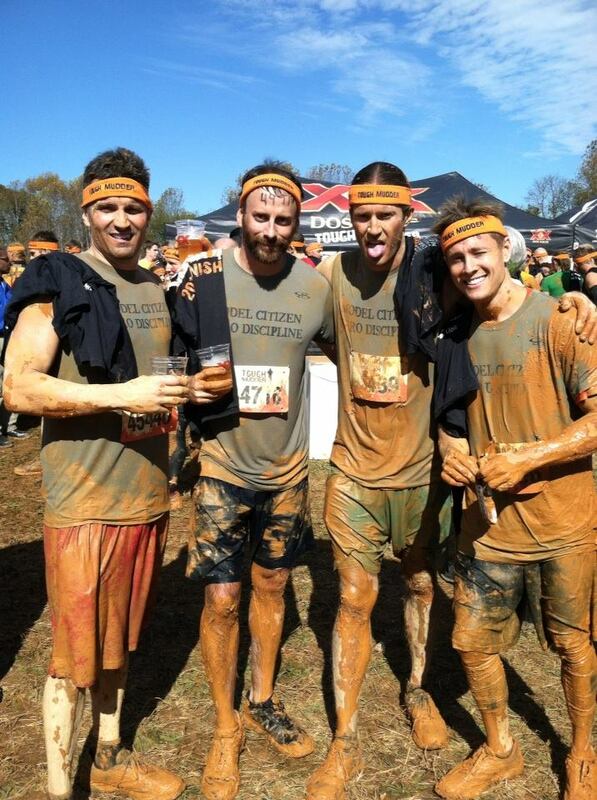 When you get done with it you will have definitely earned that head band! The Beachbody Challenge WILL change your life forever! If your tired of feeling tired, sluggish, no energy or just want to get in amazing shape. I’ll help get you going with the right fitness program & nutrition to help you reach your goals. You may be asking what is the Beachbody Challenge and how’s it going to help me? Watch the short video below (be sure to turn your sound on) and then we’ll discuss it a little further. I hope after watching that video your as pumped up as I am. There is really so much to it, but at the same time there is so little to it. I know that’s an oxymoron, but it really describes it to perfection. What I want to really stress to you is this; its all for you, for the people. The ones who are willing to do what ever it takes. It’s not for me or for the other Coaches. Its not for the corporate world or the money hungry business people out there. This is all for you. It’s to help you not only start a new healthy lifestyle, but it gives you a clear and direct foundation to get started and maintain your results for the rest of your life. In being a part of the the Beachbody Challenge you also get a free coach >>thats ME<< to help you with any questions, concerns and motivation! You also get a small private group to be apart of that will share this experience with you and essentially could become life long friends. You see, through the countless hours of research we’ve figured out that folks get better results with they feel accountable. Being a part of a small group, you tend to lean on one-another. Im going to give you the breakdown from start to finish, on how to get started in the Beachbody Challenge. You need a Beachbody Coach – thats easy, because Im right here. You need to start off by signing up for your free membership. Once you’ve created your account and filled in some of your basic information we need to figure out which program would be best for your to start out on. Most often, everyone wants to start out with the hardest or most extreme workout, but I highly recommend that if your new to fitness or starting over, we really need to pin-point a program for you to start out on. Remember, this is a lifestyle, so you don’t have to concur P90X in your first Challenge. I generally like to ask a few questions about you and your goals, and then I can make a recommendation on what I think you should start out with. Once we have your program picked out, then we chose a Shakeology flavor. There are 3 different Shakeology flavors. *Regular Shakology (animal based protein) Greenberry or Chocolate OR *Vegan (plant based protein and no dairy products) Chocolate or Tropical Strawberry.Both are equally potent with all the ingredients your body needs to become more healthy and lose weight. With Shakeology you’ll replace 1 meal each day. That’s not hard at all! Once we have the program figured out and your Shakeology preference, then we simply get that Challenge Pack. The challenge pack consist of your Beachbody workout + your first 30 days of Shakeology + 30 days of a free trial membership as a Club Member, all at a discounted price. So you basically pay less for bundling it together, oh and you get free shipping. * Just to let you know a little about the Club Membership. Being a Club Member, you receive 10% off anything purchased after becoming a member, plus you and I or just you can create a personalized meal plan for your entire family each week. It even can give a complete grocery list to follow. If you want to know more about the Club Membership go here. You need to have a Facebook account, or create one. All my Beachbody Challenge groups are private Facebook groups, within Facebook. Its just easier to keep up with everyone. This is the last step. Now you have a few more options to get started. I can place you in a Challenge Group that I am putting together myself, which usually consist of people just like you who just want to be a part of a group or if you feel more comfortable and want to get a hand full of close friends or family to join you in the group, we can do it that way also. Just know that each member must follow the steps above and they can’t already have a Beachbody Coach. Thats it. Like I said it a lot to it but at the same time is really simple. FITNESS + NUTRITION + PEER SUPPORT = SUCCESS. Its that simple. So if your ready to be apart of a loving, caring team of great people who share your interest in getting in shape, then please, Join my Beachbody Challenge Group Today!! Contact me today to get started or jump over to the Challenge page and pick your Challenge Pack. Please look below, and click the ‘Facebook Like’ button if this helped you in any way. Insanity Workout – What’s it all about? Thats it. With only those 5 essentials you can be on your way to getting in amazing shape in just 60 days. What If I need a lot of motivation? Im going to be 100% honest with you. Once you order Insanity through this site I become your free Team Beachbody Coach. That means that Im here to help you throughout this journey with motivation and tips with your fitness and nutrition. BUT, if you are the type of person that doesn’t like a challenge or your just ‘kinda’ interested in working out, this isn’t the program for you. Who is the Insanity Workout for? The Insanity Workout is for anyone! Yes it is a challenging workout, but if your 100% committed and ready to get in shape no matter whether you are an absolute beginner and/or over weight or a pro, Insanity is for you. You just have to be willing to ‘Dig Deep’ as Shaun T says many time throughout his workouts. The one thing you can absolutely count on is your gonna sweet…a lot! This program walks your through proper stretching techniques, some basic Yoga moves, Plyometrics (lots of jumping), pushups, running in place and ABS. One of the ab workouts you don’t even do a single sit-up or crunch, which is nice but you still get amazing abs! So at this point you still might be wondering if you can do this workout. YES you can. Even if your 100, 200 or even 300+ lbs over weight, male or female young or old, you can do this workout. Like I said earlier, you just need the 5 essentials. 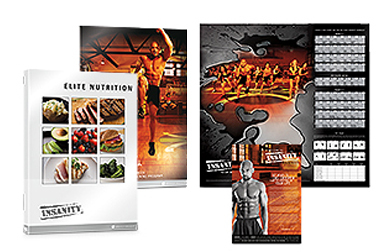 Once you’ve placed your order for Insanity or the Inanity Challenge Pack you’ll have created a profile. Start by uploading a before picture. Why is this important? You only have 1 chance for this. You will not be this same person any more once you start your journey. Plus you can submit your transformation story and possibly win some extra cash, up to $100,000! Enter in some other profile information about yourself and what led you to start this journey. You can click on the “Start Up Wizard” at the top of the screen to help you set your profile up. Schedule your workouts for the next 60 days. Scheduling your workouts will make you accountable. That might sound silly, but it works! By doing these 3 things you are committing to change. If you stick to your workouts and follow the nutrition plan that comes with your Insanity you will achieve awesome results. There are so many other things you will be able to do on your profile page such as watch videos with tips, enter in your measurements to track your progress, meet new workout buddies, recipes, nutrition tools and so much more. You’ll also be able to visit the message boards to meet new people with similar goals and even chat with the trainers. Start Now with Inanity or the Insanity Challenge Pack. Do I Need Supplements or a Lot of Weird Foods? P90X Results and Recovery. This recovery formula can be taken with the Insanity Workout. It helps recovery and refuels your body! Shakeology. In my opinion, Shakeology should be apart of your daily nutrition regardless of your workout. Theres a ton of nutritional info on my Shakeology page. In short, it improves digestion, helps you lose weight and stay healthy. I recommend it for any and everyone! If you want a healthy, extra burst of energy to help you before your workout, E&E (Energy & Endurance) is an awesome pre-workout formula. So what is the best way to order? You can get the Insanity Workout by clicking the button below. It comes with all the DVD’s a bonus workout and the Nutritional Guide. Or best way/most economical way is the Inanity Challenge Pack. It comes with all the DVD’s a bonus workout and the Nutritional Guide, your first 30 days of Shakeology on HD (home direct) in your flavor of choice AND a 30 day free trail ‘Club Membership’ which offers you a ton of advantages over the normal free membership. You can buy the challenge pack or upgrade to a Coach yourself for no extra charge. As a Coach you get an additional discount on everything including Shakeology, that extra accountability and while on your journey to becoming healthy and fit you can help others do the same and earn some extra income. No previous experience required and you don’t have to be in shape to start out. Just click on one of the buttons below to get started on this amazing workout and journey to becoming a better you! 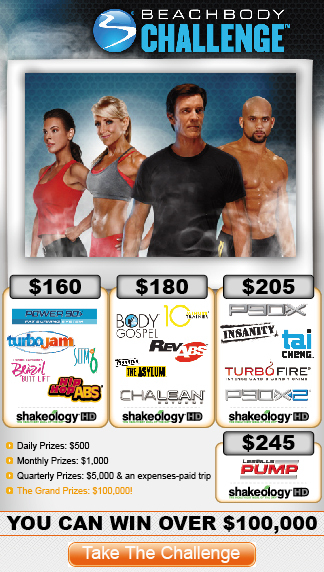 Or Become a Coach and *add in the Insanity Challenge Pack at the signup! You can also Download the Insanity Fit Test and Calendar Here. 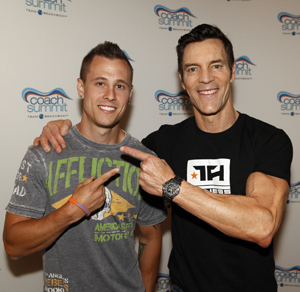 I wanted to give you a run down on Tony Horton’s P90X vs Shaunt T’s Insanity workout. I have done both of these workouts and they are both very different, but the end result is close to the same. P90X and Insanity is for anyone that simply wants to lose weight, get muscle definition and increase in energy and stamina. P90X is a 90 day program and Insanity is a 60 day program. Both of these come with come with a ‘Fit Test’, workout guide, meal planner and if you order through me you get FREE bonus workouts with each one, plus me as your coach! P90X has some great cardio like workouts, like Plyometrics (jump training), Kempo X (punching & kicking) and Cardio X (is a lighter version of Plyometrics). The cardio workouts are really good workouts that you do in between the weights, pull-ups and push-ups. Yoga is an acquired taste, but it is worth it to do because it definitely helps with flexibility and control. P90X was designed to turn fat into muscle. 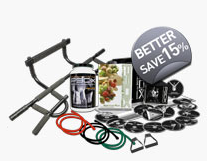 With P90X there is some equipment that you need. Basically dumbbells or resistance bands and a pull-up bar. For more information see my post for P90X Equipment. Insanity takes a different approach than P90X. There are no weights involved with Insanity. Its mostly just a fast paced high impact cardio style workout. Most all the moves are simple and easy to follow and very effective. Targeting most all the muscles in the body you can think of. This workout will also build up you lungs for those out there who like to run a lot. Theres lots of running (in place), jumping, push-ups and a great ab routine with NO sit-ups involved! Both P90X and Insanity are great workouts for any fitness level. Once you’ve completed one or both of these workouts, there’s a hybrid workout that combines both P90X and Insanity that is really challenging, but oh-so-worth-it! I would recommend either of these workout to anyone wanting a solid routine to follow, and wants to get in AMAZING shape! Why am I Gaining Weight While Doing Shaun T’s Insanity Work Out? Why am I gaining weight while doing Shaun T’s Insanity? Aren’t I supposed to lose weight with Insanity? I keep getting this question right around the week 2 or week 3 mark for people doing Insanity. So did some digging to see what kind of information I could find. Low and behold I found a great post by Chalene Johnson, creator of TurboJam, TurboFire, ChaLEAN Extreme and many other fitness programs. Chalene is talking about Chalene Extreme but what she talks about will apply when starting any new work out regiment. Here is her take on the subject. “Probably the most common question I get when I release a new exercise program is, “Help! I’m gaining weight! Am I doing something wrong?” This is a common phenomenon with any new exercise program, Turbo Kick, Turbo Jam, Hip Hop Hustle, you name it! It’s especially common (and temporary) with intense strength training programs like ChaLEAN Extreme or Tony Horton’s P90X. The motivation to start a new exercise program is almost always to lose weight loss. However, what most personal trainers know and most at-home exercisers do not, is that a new exercise program often can cause an immediate (and temporary) increase on the scale. (Notice I didn’t say weight gain! I’ll explain.) This common increase in the scale is also the reason why perhaps millions of people start and then quickly quit their resolution to get fit. “protect and defend” the effected or targeted tissue. Exercise physiologists refer to this as delayed-onset muscle soreness, or DOMS. This type of soreness is thought to be caused by tissue breakdown or microscopic tears in muscle tissue. When this happens the body protects the tissue. The muscle becomes inflamed and slightly swollen with fluid retention. This temporary retention of fluid can result in a 3- to 4-pound weight gain within a few weeks of a new program. Keep in mind that muscle soreness is not necessarily a reflection of how hard you worked. In fact, some people feel no signs of muscle soreness, yet will experience the muscle protection mechanisms of water retention and slight swelling. Most people are motivated enough to put up with this temporary muscle soreness. Yet, many, especially those who really need immediate weight loss to keep them motivated in those first couple of weeks become discouraged and quit! When I worked with a group of 70 test participants during the development stages of ChaLEAN Extreme, this happened. Who was the most upset and discouraged? You guessed it… the women! I’m happy to report with absolutely every single woman (and man) in our group, the weight increase was temporary and never lasted more than 2 weeks before they started to see a major drop in the scale. However, these people had the advantage of working with someone who was able to explain to them why this was happening and assure them the weight would come off if they stuck to the nutrition plan and stayed true to the program. For those of you who are following the ChaLEAN Extreme phase plan, keep in mind that when you start each phase, your body will be “in shock” again. Don’t be surprised or discouraged if you experience a temporary gain on the scale the first week of each phase. My own personal example of this is running 10K’s. I don’t do it very often, maybe 1 or 2x a year. 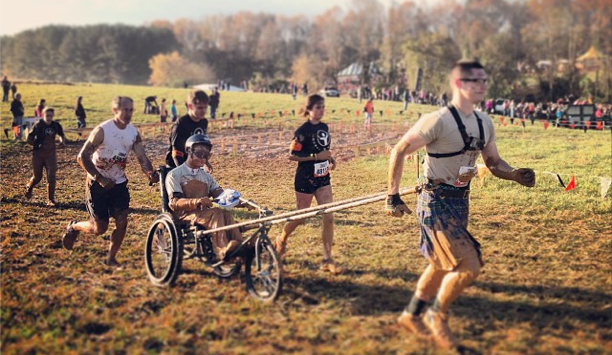 Even though I run on a regular basis, when you run a race you push much harder. It’s natural for me to be “insanely” sore the next day. Its also very common for me to see the scale jump 4 pounds the next day from forcing fluids post race and the resulting DOMS. Even though I know the cause of it, it’s still a bummer. We’re all human and hard work should mean “results”. Hard work equals results, but our bodies are amazing machines and they know how to protect us from hurting our selves. Soreness forces you to give those muscles a break Ultimately you will lose the weight and you will change your metabolism in the process. The key is understanding that this is a normal and temporary and stick with the program!! If you experience a significant weight gain (exceeding 5 pounds) which does not begin to decrease rapidly after the second week, guess what it is??? I’ll give you one hint… you put it in your mouth and chew it. You know it! Your food (or calorie laden beverages). Newsflash friends.. exercise doesn’t make you gain weight. Consuming more food than you burn makes you gain weight! So if after two weeks you are not losing weight, have gained weight that’s not coming off, it’s time to take a close and honest look at your food intake. It’s time to find out what you’re burning in calories each day. Have your RMR or BMR tested. This can be done for less than $50 and the information is invaluable. It takes out the guess work. Google “hydrostatic body fat testing _______ ” and insert the name of the big city you’re closest too. Companies that do HBFT also do BMR testing. Knowledge is king. Possibly, but if you’re following ChaLEAN Extreme correctly, you should be losing fat and gaining muscle and the fat loss should be much more substantial than the rate at which you can physically put on muscle. This is even true for they guys. Of the 70 plus people in my test group, every single one of them lost body fat and gained muscle and not one of them gained weight. I believe the average weight loss after 4 months was 28 pounds with many people losing 40 plus pounds. Even the men, who as you can see put on a lot of muscle, were seeing huge drops in the scale. We tested their muscle composition at the beginning and at the end and 100% of the participants maintained or gained muscle while achieving substantial weight loss. That’s the key to keeping weight off long term, i.e. muscle. Muscle burns fat. But you’ve heard me say that before. Be patient. You’ll get the results you want, if you stick to it! I hope this helps you understand why you might be gaining weight with Shaun T’s Insanity or any work out program for that matter. Stick with it and your results will come. Your body will thank you!